The opening ceremony of the international youth tournament UTLC Cup 2018 was held today at the Sapsan Arena. The event was attended by Deputy General Director of the company “Russian Railways” Andrei Starkov, the President of the United Transport and Logistics Company – Eurasian Rail Alliance Alexey Grom, General Director of the FC Lokomotiv Ilya Gerkus, head of the Professional Football Department of the Russian Football Union Sergei Kulikov, senior adviser of the Belarusian Embassy in Russia Vasily Chernik and ex-forward of the Russian national team Dmitri Bulykin. “On behalf of the shareholders of UTLC ERA I want to welcome everybody at the traditional tournament, UTLC Cup, which is held by the UTLC ERA. I want to wish the participants to have success in a fair and uncompromising fight, and I wish all of us to get bright emotions from the matches”, – said Andrei Starkov, the Deputy General Director of the JSCo “Russian Railways”. “I am very glad that our country and our city remain the center of the football festival. I wish good luck and bright impressions for all!”, said Alexey Grom, the President of the United Transport and Logistics Company – Eurasian Railway Alliance and welcomed the participants. “Big thanks to the UTLC ERA and JSCo “Russian Railways” for the opportunity given to host this wonderful tournament for the second time. 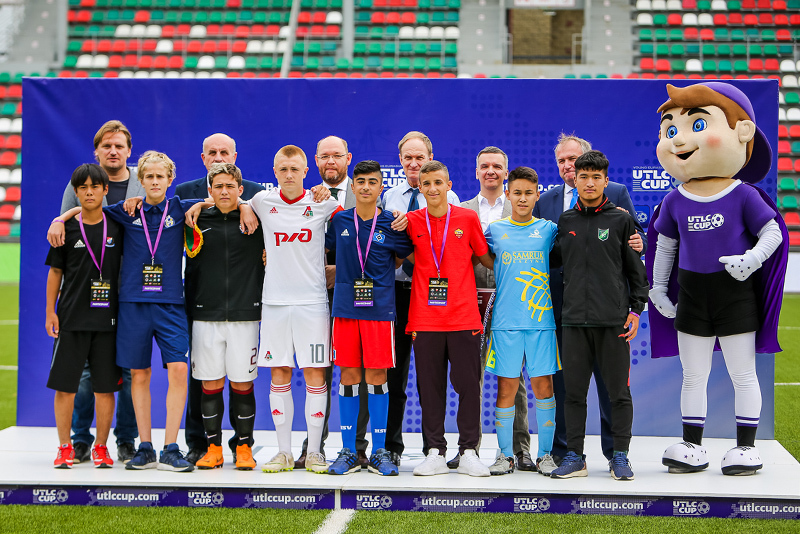 Our boys can meet with youngsters from different countries, have fun and get acquainted with other teams”, — said Ilya Gerkus, the General Director of FC “Lokomotiv”. The second international football tournament for U-14 players UTLC Cup 2018 is held in Moscow from August 15 to 19. The Cup unite young players from Europe and Asia together. Eight teams take part in the competition: AS Roma (Italy), Hamburger SV (Germany), AC Sparta (Czech Republic), BATE (Belarus), Lokomotiv (Russia), FC Astana (Kazakhstan), Zhejiang Greentown (China) and Yokohama F. Marinos (Japan). You can find the schedule and participants of the competitions on our website.